This paddle is sleek, pretty, and will appeal to many beginners. It is good for beginners and those who like light pain, or people who just want a toy that's good for warming up. It's got dual sides for all of your thuddy and stingy needs! Let me set the record straight and say that I am not a fan of 50 Shades of Grey. I find this toy overpriced for what it is, and that is due to that brand name being attached to it. I never would've purchased this toy had I not won it, but I will say that I definitely really like it and find myself using it again and again. This toy has two sides, so you definitely get to feel like you're getting two paddles in one. It is made of satin (a greyish, silver shade) and faux leather. The satin side has a thin layer of padding inside of it, so it is really good for warming up your bottom. It has a thuddy feel to it and you can swing it with a lot more force. The faux leather side has a nice sting to it. It will leave the bottom red and will definitely hurt if you put some force behind it, but it probably won't bruise. The aesthetics are nice. I'd say the color is more silver than grey. The handle is a very nice length for both my small hands and my partner's large hands. There is a small cord attached to the handle so that you can hang it on a hook for display purposes. The satin is very soft and feels like it is a nice quality. The toy itself is not very heavy in the slightest, so it can be easily used without making you feel tired. This toy is one that I recommend to both beginners and the more advanced. It's really nice for those who are nervous about pain, or who are not big pain sluts. It can be utilized in both light play scenes and to warm the bottom up for bigger, meaner toys. 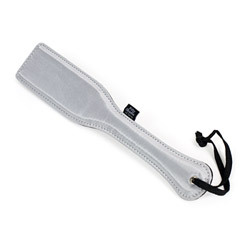 Thank you for viewing Fifty Shades of Grey Twitchy palm – flogging toy review page!